Do you want to look younger by your next birthday? First 50 customers to present J Card at Estee Lauder counters will receive a complimentary sample*. This Promo is EXCLUSIVE only to J Card Members! Visit any Estee Lauder counter for a complimentary personalized skin consultation plus first 100 to subscribe to Estee Lauder's e-Newsletter (just drop by any Estée Lauder counter and fill in your details) will receive an Advanced Night Repair Sample absolutely free*. 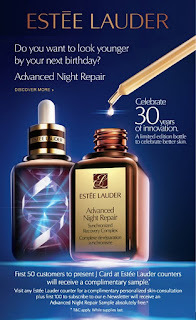 Visit Estee Lauder facebook page for more information.